Another of the silver screen's great character actors. 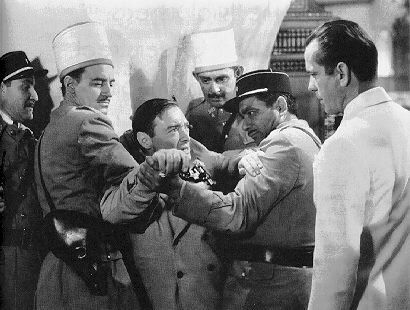 Probably his most famous role, the "cut-rate parasite" Ugarte in CASABLANCA (1942) with Humphrey Bogart. "You know Rick, I have many a friend in Casablanca, but somehow, just because you despise me you're the only one I trust." 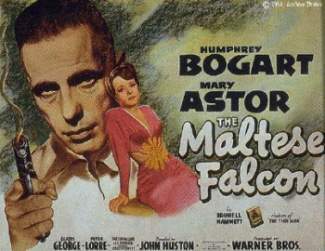 A poster from John Huston's THE MALTESE FALCON (1941) again with Bogart. "No. No. Our private conversations have not been such that I'm anxious to continue them. Forgive me for speaking so bluntly, but it is the truth." --as Joel Cairo in THE MALTESE FALCON (1941). With Paul Lukas, Kirk Douglas, and James Mason in the Disney classic, 20,000 LEAGUES UNDER THE SEA (1954). Peter Lorre edited by Gary J. Svehla and Susan Svehla (Baltimore, MD: Midnight Marquee Press, c1999). The films of Peter Lorre by Stephen D. Youngkin, James Bigwood and Raymond G. Cabana, Jr. (Secaucus, N.J.: Citadel Press, 1982). Masters of menace: Greenstreet and Lorre by Ted Sennett (New York: Dutton, c1979). Heroes of the horrors by Calvin Thomas Beck (New York: Collier Books, 1975). 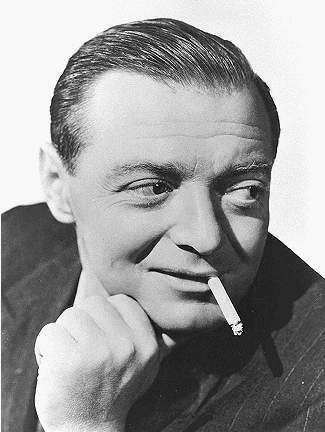 TVNow's monthly Peter Lorre schedule -when his films will be on TV.